Cisco produced a few different network architecture guidelines for enterprise networks. For those of you who are preparing the CCDA, you will encounter sooner or later these designs and best practices. As, I never found a document compiling every models for my CCDA preparation, I decided to create this one. Below, a sum up of main Cisco’s network models: Hierarchical Model, Entreprise Campus Network, Entreprise Composite Network Model (ECNM), Datacenter Network Model, Service Oriented Network Architecture (SONA), Security Architecture For Entreprise (SAFE) and Cisco Borderless Network. 1 tiered architectures are designed for small offices that do not need enhanced services (e.g. : branch offices) or so small that they can keep up with all-in-one boxes. 2 tiered architectures are appropriate for mid-sized company that do not want to invest and maintain lot of devices. Collapsed core and collapsed distribution layer fit well in these environments as they typically use multilayer switches and converged networks. 3 tiered architectures are generally used in medium to large environments. It allows an easy and neat network segmentation. On the operational side different technicians could operate at each layer according to their competency area. However if this model remains easy to understand, easy to design, and easy to manage it shows its limits in large environments. Entreprise campus describe large / multi-building entreprise networks, typically large companies headquarters. This design is an extension of the traditional 3-tier hierarchical model. It is more modular to support advanced service delivery (datacenter module, wan module, wireless, DMZ…). This design is enhanced in the Entreprise Composite Network Model. The entreprise composite model use the previous architecture and integrate specific modules delivering specific services. The SP Edge layer describes the related technologies used on the service provider side, and the remote modules define connection ends. 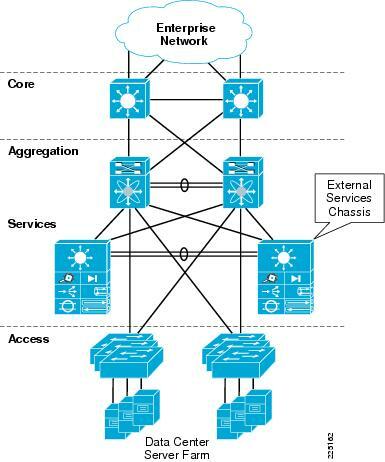 Datacenter network model is designed for the enterprise datacenter. Networks in such places undergoes different constraints and uses different technologies which explain the need for specific design guidelines. Datacenter network model has 3 layers : DC access layer, DC distribution layer and DC core layer. SONA is a set of high level network design guidelines that aim to improve business agility. The objective is to do a better use of the underlying network infrastructure to better serve mission-critical applications and key areas of the entreprise. SAFE provides design and implementation guidelines to help create secure and reliable networks. Which technologies does SAFE use ? Please refer to SAFE documentation and SAFE book for detailed implementation guidelines. The idea behind the Borderless Network is : anyone, anytime, anywhere, anything. The connection must be fast, reliable, secure and seamless. This is actually more a conceptual design with corresponding technologies than a real implementation document. 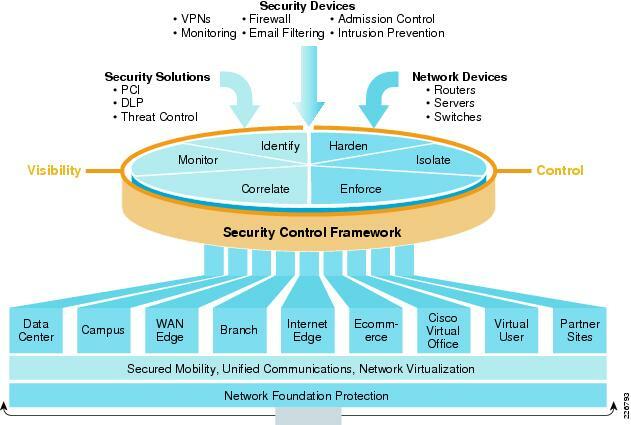 This architecture enables next generation use such as mobility and BYOD. 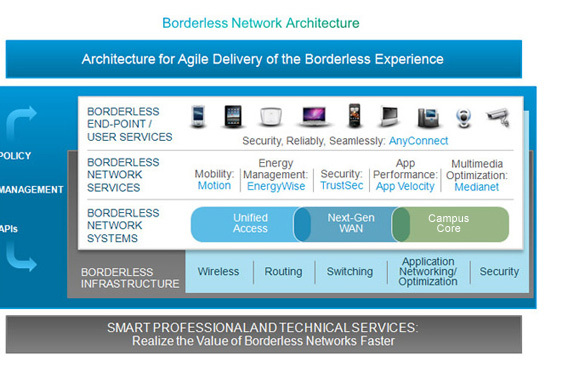 All information on the Cisco Borderless Network Architecture webpage.